As the offseason wears on, the Carolina Hurricanes will look to fill holes in their lineup. There will be many ways to do this. The NHL Draft is under a month away, the trade market will be very active, and free agency always provides options both for depth roles and top-of-the-lineup spots. Other options that will also be explored, like all other years, will be players that are already working their way up in the system. This year, it provides some very interesting names with their fair share of pros and cons. Here, we will take a look at several young players who could make the jump to the Hurricanes’ roster as soon as opening night. 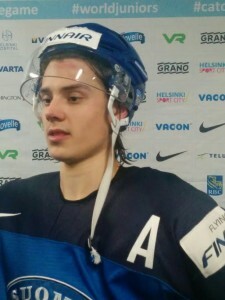 One of the biggest breakout prospects across the league last year was Finnish forward Sebastian Aho, a 2015 second-round draft pick. The 18-year-old finished second in Liiga MVP voting, tallying 45 points in 45 games despite missing time due to injury. He was also named a top-three player on Finland’s U20 World Junior club, finishing the tournament with 14 points in seven games on a line with top 2016 prospects Patrick Laine and Jesse Puljujarvi. More recently, Aho was an impact player in Finland’s dominant run to a silver medal in the IIHF World Championships. He finished that tournament with seven points in ten games while skating with and against some of the NHL’s top players. Finland lost to the Bill Peters-led Canadian squad in the gold medal game, 2-0. Aho stands at just 5’11”, 172-pounds, but his offensive instincts are a thing of beauty. He is a top-flight puck handler who makes the right decisions. His talent translates incredibly well to the man advantage as well, as he is a remarkable half-wall player who distributes the puck with authority and precision. The young Finn isn’t just a playmaker, either. 20 of his 45 points in the Liiga this past season were goals. He has an accurate shot and he isn’t afraid to attack the net in order to register a dirty goal. He’s a fierce competitor with a high motor, and it’s a joy to watch him go at it on a shift-to-shift basis. He has the skill and work ethic to make a big difference in the NHL for a very long time. Throw out the pencil, because Sebastian Aho’s name is likely written in ink on the Carolina Hurricanes’ opening night roster. Expect him to be signed to an entry-level deal within the next few months. Another forward on the smaller side, Sergei Tolchinsky is a player with high offensive upside that could crack the lineup very soon with the Hurricanes. Signed as an undrafted free agent shortly after the 2013 NHL Draft, Tolchinsky dropped the jaws of everyone in attendance at Carolina’s prospect camp. In 189 OHL games, the Russian forward managed to tally 237 points, including this gorgeous goal in March of 2014. Tolchinsky just finished up his first year as a professional hockey player, playing a majority of his games with the Charlotte Checkers of the AHL. He picked up 36 points in 72 appearances and earned his first NHL call-up in the process. He skated in two games for the big club and picked up his first NHL point, an assist on Justin Faulk’s March 31 goal against the New York Rangers. Ironically, Tolchinsky was also invited to New York’s development camp back in 2013, but he ultimately signed on with the Canes. What Sergei Tolchinsky lacks in size, he makes up for in sheer skill. He can do things with the puck that many people can’t fathom. He’s an exceptional offensive talent, and if he can make up for his lack of size with his magical skating prowess, he can be an impact forward in the NHL. However, the jury is still out on if he can make the NHL roster out of camp this October. This will largely depend on what the Carolina Hurricanes do in the trade market and free agency this offseason. That being said, based on his filthy mitts and offensive instincts, you can’t completely count him out. Carolina Hurricanes 2014 seventh overall pick Haydn Fleury has taken major steps forward with his game over the past two years despite experiencing some ups and downs in the process. After struggling in the 2014-2015 season, the big two-way blueliner is coming off of his most efficient offensive campaign with the Red Deer Rebels of the WHL. He posted 41 points in 56 games in the regular season and then followed that up with nine points in 17 playoff games as the Rebels made it to the WHL semi-finals. They were then taken down by the eventual WHL champion Brandon Wheat Kings in five games. Fleury was a top pairing defenseman on Canada’s U20 World Junior team in early 2016, but the Canadians collapsed in the tournament and finished without a medal in the process. He had just one assist in five games. Currently, Fleury and the Rebels are battling their way through the Memorial Cup Playoffs, and they are fresh off a big overtime victory over the same Wheat Kings team that eliminated them from the WHL playoffs. They clinched the series with the win and have advanced to the semi-finals. In terms of making the NHL roster out of training camp this season, Haydn Fleury faces a very tall task. With Carolina’s d-corps seemingly already in place with Justin Faulk, Noah Hanifin, Jaccob Slavin, Brett Pesce, Ron Hainsey, and a fully recovered James Wisniewski, it will be tough for Fleury to make himself stand out amongst a group of very young and capable blue liners. It seems much more likely that Fleury starts out in the American league with the Checkers where he can get an appropriate amount of ice time and transition his game to the professional level. Looking forward, Fleury is a big, defensively stable two-way defenseman who should develop into a top-four guy sooner rather than later. He seems to be a name that has been quickly forgotten on the back-end after the emergence of Hanifin, Slavin, and Pesce. His play hasn’t dictated his falling off, though. He’s a very reliable two-way guy, and despite his ups and downs in juniors, he is still a former seventh overall pick with a healthy amount of upside. Like Sebastian Aho, Nicolas Roy is a 2015 draft pick with boatloads of upside. Listed at 6’4″, 197-pounds, Roy has a massive frame to work on over the next few years. His size is truly one of his best tools as he is able to impose his will on opponents in the corners, in front of the net, and in his own end. The 19-year-old broke out as a star in the QMJHL this past season with the Chicoutimi Saguenéens, tallying 90 points and netting a league-leading 48 goals in 63 games. He was also a +19 player. Roy’s goal scoring and size are two of his best attributes, but he contributes in a plethora of other areas. He was amongst the QMJHL leaders in faceoff percentage in 2015-2016, and he took big steps forward in his two-way game. He has long reach and an active stick in his own end, and while he can stand to use his body more effectively on the defensive side, he does a good job at flushing people out of scoring areas. This is a player that could make a splash in training camp because of all the reasons listed above. As a fourth-round draft pick, he has overachieved big time over the past year, which could lead to him fast tracking to the NHL. His versatility could also help him in the short-term as he can play both center and the wing. However, his skills down the middle should not be wasted. He is too big and too good of a faceoff taker to not be used as a center in the NHL long-term. Like Tolchinsky, Roy’s fate will be heavily impacted by the club’s level of activity in the offseason. If Ron Francis adds a lot of talent to his forward unit, it makes much more sense to send him back to Chicoutimi to play out his final year of QMJHL eligibility. Another year of hockey in the Q would allow Roy to improve on his already impressive game. He could spend another year being a star and putting up big numbers before playing with the big boys of the North American professional ranks. It only makes sense to bring him into the fold if he is completely ready. There’s no need to rush Roy to the NHL right now.